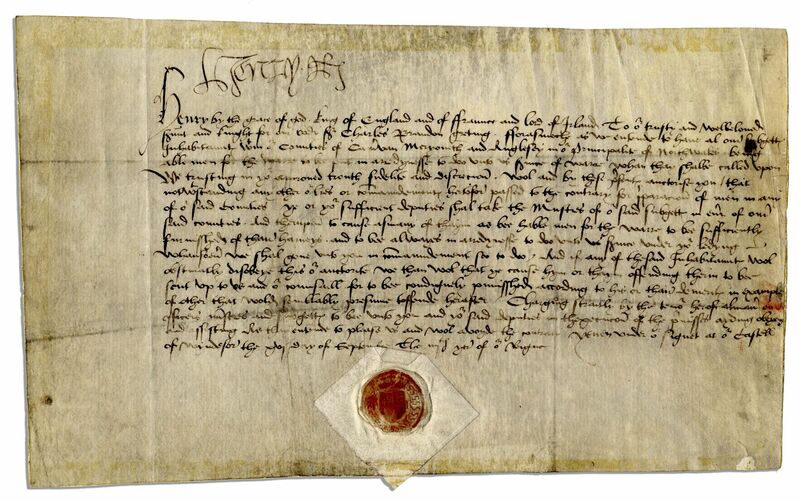 Important Henry VIII order signed ''Henry R'', as King of England and Ireland, commanding Sir Charles Brandon to gather troops in preparation for his planned invasion of France, as part of the Italian Wars. 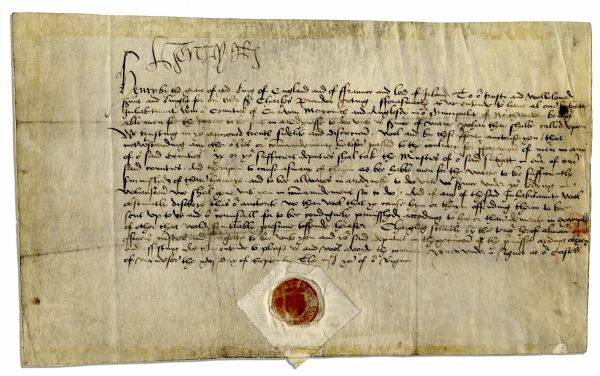 Dated 16 September 1512, only three years into his reign, Henry VIII here takes advantage of the Pope's ''Holy League'' against France to expand his territory in the northern part of that country. To that end, he orders the mustering of troops from the counties of Carnarvon, Merioneth, and Anglesey in Wales. Its compelling text reads in part: ''...'cause asmany of thaym as bee hable men for the warre to bee sufficiently furnisshed of thaire harneys and to bee always in arredynesse to doo unto us s[e]rvice under yo[u]r ledyng...'' Those who refuse are ''...to be condignely punisshed according to his or thaire demerits in example of other that wolde semblably presume toffende herafter...'' Sir Brandon, to whom this order is directed, went on to become the 1st Duke of Suffolk following success in August 1513 at the Battle of the Spurs -- using the men culled from this initiative. A red seal is affixed to bottom center. Single page runs 16 lines on vellum and measures 11.25" x 6.5". Toning, creasing and some light staining, else near fine. An important document in the early years of the Italian Wars, which raged for more than sixty years, ultimately involving most of Europe in a complex conflict that spawned wars within wars.